Many auction companies have been using the Multi Parcel Software installed on their laptop in the ball room for years. Many companies are using simulcast with their live clerking software, making it just a part of their live auction process that they use from day to day. Put them 2 things together and what you have is Simulcast Multi Parcel auction software that we have created. 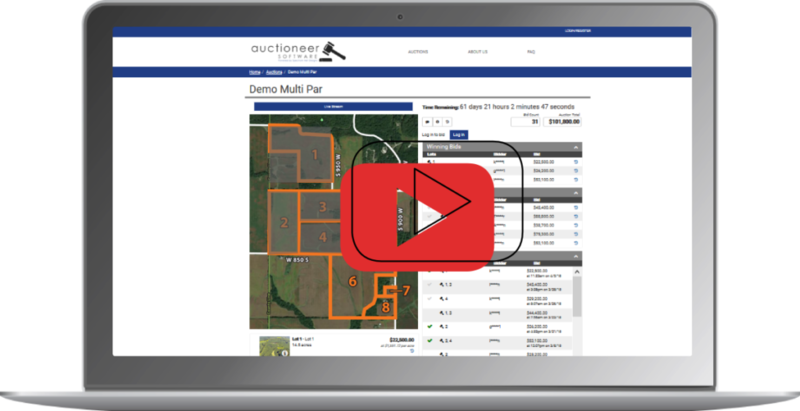 You can now run a traditional Multi Parcel auction that you are familiar with along with providing the simulcast extension of the software to your bidders online. They can place bids, place combos, ask questions, request pricing for a combo in real time. This is powerful platform developed for you so that you can get the maximum prices for your sellers. Remember, this is NOT just an online bidding, This can be used in conjunction with your ballroom atmosphere where you clerk will take bids from the floor and also communicate the bids coming in simultaneously from the internet. Once you use it and you want some tweaks made to it? That is no problem either, our 9 developers on staff are here in our office ready to make them tweaks for you so that the software can work exactly how you want it to. We have companies currently using the software and have used it customized and not customized.